Best grown in moist, rich, humusy, medium to wet soils in full sun to part shade. Best in cool summer climates in part shade areas. Tolerates close to full shade. Consider pinching back the stem ends in spring to reduce mature plant height, especially if growing plants in strongly shaded areas where they are more likely to need some support. In optimum environments, however, staking is usually not required. Appreciates a good composted leaf mulch, particularly in full sun areas. Spreads slowly by rhizomes to form large clumps, but is not invasive. Will self-seed in moist soils. Propagate by division, cuttings and seed. Chelone lyonii, commonly called turtlehead, pink turtlehead or Lyon’s turtlehead, is an upright, clump-forming, rhizomatous perennial in the figwort family which typically grows 2-4’ tall on stiff, square stems. It is native to wet woodland areas and streams in the southern Appalachian Mountains from Virginia to South Carolina and west to Tennessee, northern Mississippi and northern Alabama. It has escaped gardens and naturalized in parts of New England and New York. Hooded , snapdragon-like, two-lipped, pink flowers (to 1” long) bloom in tight, spike-like terminal racemes from late summer into fall (late July to September). Flowers have puffy pink corollas with lower lips bearded with yellow hairs. Flowers purportedly resemble the heads of open-mouthed turtles, hence the common name. Ovate, coarsely-toothed green leaves (to 3-6” long) have slender petioles, rounded bases and pointed tips. 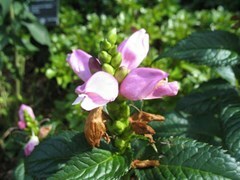 Genus name comes from the Greek word chelone meaning tortoise in reference to the turtlehead shape of the flowers. Specific epithet honors John Lyon (1765-1814), American botanist, who was an early explorer of the southern Appalachians. ‘Hot Lips’ features rosy pink fall flowers (richer pink than the species), bronze green maturing to dark green foliage (deeper green than the species), and red stems. No serious insect or disease problems. Some susceptibility to mildew, particularly if soils are kept on the dry side and/or air circulation is poor. If grown in too much shade, plants may need some support. Shade or woodland gardens. Native plant gardens. Bog gardens. Pond or water garden peripheries. Good border plant as long as soil moisture requirements can be met. Interesting cut flower.